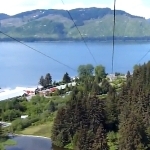 Welcome to the longest zip wire in the world as recognised by The Guinness Book of Records. Opened in January 2018, the Jebel Jais Flight zip wire in Ras Al Khaimah, UAE, measures a staggering 2,831.88m (2.5km - 1.5 miles) in length and can reach unbelievable speeds of up to 150 k/mh (93mph). Come and join us to watch this amazing film taken of the full ride, from the comfort of your own home. You can be safe in the knowledge that you are dealing with a well-established UK based professional family run business that is totally passionate about all things to do with zip wires. 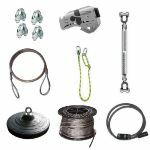 With over 20 years' experience, we have built up an enviable reputation for supplying worldwide both domestic consumers and trade customers with the largest and best range of top quality zip wire kits and zip wire equipment at competitive prices. It's fair to say that with all that experience and a proven track record behind us, you can trust that we know what we are talking about. As a family business we care about our customers and take time and effort to source the best quality products from our business partners around the world at affordable prices. We pride ourselves on providing a professional and speedy service at all times, and we are here to offer all our customers old and new FREE, HONEST AND IMPARTIAL ADVICE to help YOU select your perfect zip wire equipment or zipwire kit..
As you will see while looking through our website, we offer our customers only the best in top-quality zip wire kits and equipment at affordable prices. 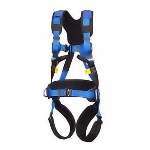 All our equipment has been chosen for its design, safety and the fact it has been made to last for years to come. 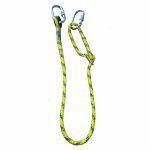 Please make sure that when comparing zip wire equipment or zipwire kits, you are comparing "like for like" as "You get what you pay for" Nobody beats The Zip Wire Company for the quality of their equipment. 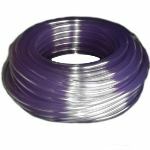 By using the very best top-quality equipment, combined with our knowledge of zip wires, you will not be disappointed with your purchase from The Zip Wire Company. Then the whole family can enjoy many hours of safe and trouble-free fun on a zip wire. 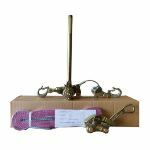 By following our simple and easy to follow generic installation instructions, you, and a couple of friends, can have you zip wire up and running in no time at all. 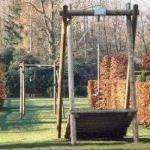 If you are considering installing a zip wire in your garden, then this can be built to any length between 20m to 200+m and can be built between either two trees, two supports or a mixture of both. All you need is a clear line of sight with clearance from any obstacles on either side. In our experience over the years, between 50m - 100m seems to the average length brought by our customers. 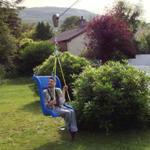 What ever length your zip wire run is going to be....you will be guaranteed a great exhilarating and fun filled ride. 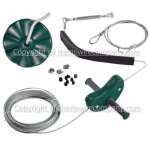 Not only do we supply and sell equipment for the domestic market, but our selection of equipment which has been carefully selected from a quality and safety aspect, has also been popular in the small commercial market too. 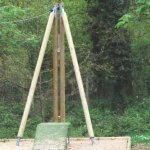 Looking for a zip wire to put up in your local play ground, farm shop or even a holiday park, look no further as we have just the equipment for you here at The Zip Wire Company. Buying and installing a zip wire can be a big investment and some of our previous customers have had questions they needed advice with before purchasing. So this is where our helpful and friendly support team come into their own by offering free, friendly and helpful advice not only through the selection process, but also supporting you if needed through both the installation process and in the very rare case of a problem - after sales too.